On April 21, 1918, the inaugural Women’s Dipsea Hike drew 307 entrants. The 14th Dipsea Race, held five months later, had 80 finishers (all men; women were not officially admitted until 1971) and there were never more than 300 finishers until 1966. Though called a “hike” to bypass the Amateur Athletic Union’s national ban on women participating in distance races, it was a bona fide race with winner Edith Hickman’s time of 1:18:48 achievable only by fast running. Four additional Hikes were held with Mill Valley’s Emma Reiman, later selected as a charter member of the Dipsea Hall of Fame, winning twice with a best of 1:12:06. 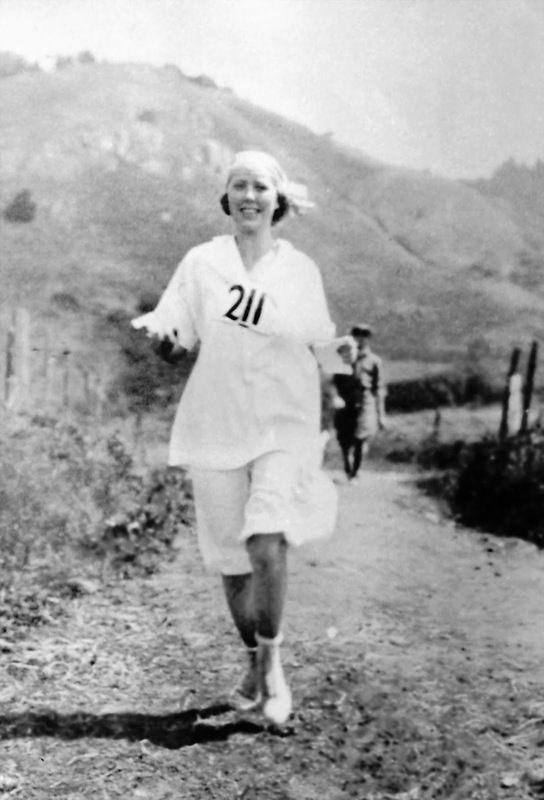 The Hikes, staged ten years before women were first allowed to run track in the Olympic Games (in 1928, with the 1500 meters not added until 1972 and the marathon in 1984) were truly pioneering events in the still evolving battle for equality for women in sports, and well beyond. But, bowing to cries that such strenuous efforts were dangerous to women’s reproductive organs, and that women’s distance running was somehow unseemly, the Hikes were cancelled after 1922. On Saturday morning, April 21, 2018, the exact 100th anniversary of the first Hike, the Dipsea Race Committee, in association with One Tam, will stage a commemorative Centennial celebration. Five hundred women—the limit set by land managers—will run and walk the full 7.2 miles of the Dipsea Trail from Mill Valley to Stinson Beach. After will be a lunch at the Stinson Beach Community Center with featured speakers including Joan Ullyot, who won a Dipsea Race black shirt in 1972 and whose book “Women’s Running” helped popularize the sport, and Rita Liberti, a college professor who wrote her graduate dissertation on the Women’s Hikes. Entry to the Centennial Hike and to the luncheon will open in January; check the Dipsea Race website, www.dipsea.org. No same day registration will be permitted. All entrants will wear a hand-drawn, cloth bib number, in the style of the original Hikes, and receive either a commemorative t-shirt or head scarf. Period dress is encouraged, and prizes will be awarded for the most authentic attire. All participants begin together (no handicapping) at 9 a.m. in Mill Valley’s Old Mill Park, .3 miles up Throckmorton Avenue from downtown. Participants may run or walk as they choose but must stay on the Dipsea Trail (no shortcuts whatsoever) and the event is non-competitive, with no finish prizes or recording of finishing order. After, everyone is welcome to enjoy One Tam’s Earth Day weekend festivities at Stinson Beach. Due to space considerations at the Stinson Beach Community Center, the lunch there is limited to 150 (men OK) and requires a separate entry form and fee. Return shuttle bus rides to Mill Valley will be offered on a first-come basis. The 75th anniversary of the Women’s Hikes was celebrated in 1993 and two participants attended. The last Hike survivor, Helen Signorio Stratta, died in 2009 at age 107. Hike descendants are especially encouraged to participate. Indeed, Barbara Van Meurs, the daughter of 1918 winner Edith Hickman, will serve as honorary starter, assisted by her own daughter and granddaughter. While there is a certain cachet to being “the best Dipsea racer never to have won,” most runners would trade the title for a victory. Jack Kirk once held the honor, compiling a brilliant record but going 20 years before his first win. Russ Kiernan then assumed the mantle, recording 16 top-ten finishes before the first (n 1998) of ultimately three wins. Mike McManus won eight Best Time Awards through 2000 but has yet to break the tape. Chris Lundy and Alex Varner then moved to the fore, both owning six Best Time trophies without a win. Lundy also had three runner-up finishes. On June 11, Lundy exited the “never to have won” ranks when she came from behind late to win. Arriving second was Varner. Lundy, 46, became a rarity in recent Dipsea history, a winner who had achieved national class status as an open (as opposed to age group) runner. In some ways, the last such winner was Darryl Beardall, back in 1978. Lundy ran at Penn, then compiled a brilliant career, not yet over, in mountain racing, where she represented the United States in several world championships. She is a veterinarian, lives in Sausalito and is a long-time member of the all-women Impala Racing Team. Lundy won her first women’s time title in 1999, when she clocked a 56:05 and finished second overall. The mark remains the third fastest women’s time ever. Lundy added time trophies in 2006, 2010, 2012 (also second place), 2013 (again runner-up, just four seconds behind winner Diana Fitzpatrick) and 2015. Her six is two more than any other woman. Lundy sat out the 2016 Dipsea after undergoing left hamstring surgery. Varner, finally leaving the scratch group upon turning 31, made a gallant effort, passing Saari surprisingly early, at Cardiac. His 50:29 won him a seventh Best Time trophy (the previous six had been consecutive, among the greatest feats in Dipsea history). Varner’s time was 23 seconds faster than in 2016, but slowest among his seven winning efforts. Varner’s seven wins ties Mason Hartwell, one behind Mike McManus’s record of eight. Jamie Rivers charmed the awards ceremony crowd by describing what it was like to be so alone during the Dipsea Race. She did earn a major prize, the Alan Beardall Family trophy, with husband Roy (10th). Saari had again won the Equinox Marathon in Fairbanks in September; he wrote a book on the history of that race in 2016. But he slowed 3:08 from his Dipsea runner-up effort of last year and had to settle for fourth. Slower times, despite seemingly ideal chilly running weather, seemed the norm. Last year’s third placer, Heath Hibbard, also slowed over three minutes and ended up ninth. The 2016 winner of black shirt #35, Sarah Tabbutt, ran nearly two minutes slower, yet now finished 34th. Lundy’s winning clock time (actual time less head start) was 2:41 slower than Pilcher’s last year. --Winning the High School trophy was Marin Catholic freshman Lyle Rumon, 21st. He got a “high-five” from one of his coaches there, Diana Fitzpatrick, when she came up for her black shirt. There was some controversy over the female high school trophy. Vanessa Miller, 13, finished 36th, nearly 200 places ahead of the winner, Quinn Lehmkuhl. But Miller was only to enter high school in the fall, so ruled ineligible for the prize. --Former winner Hans Schmid turned in arguably the most astonishing performance of the day, winning a black shirt (#35) at the age of 77. That is three years beyond where men’s head starts cease to increase (age 74). --The Pelican Inn Track Club—the name derived from the Muir Beach pub members patronize after evening runs—dominated the team competition. Their top five finishers arrived places 2-6. --Joannie Siegler, 60, a decorated age group runner out of Davis, won the Runner Section in a tight finish. She recorded an actual time of 1:13:52 (20hc), reaching the finish one place, and less than five seconds, ahead of runner up Tyler Hansen (54:57, 1hc). --Bob Bunnell, who completed his 50th Dipsea race day, was inducted into the Dipsea Race Hall of Fame as the 32nd member. Bunnell ran his first Dipsea in 1965. In 1967, he finished second (five seconds behind winner Jack Kirk), winning both the High School and Best Time trophies. He won a second Time trophy in 1976. Both his wife Derry and son Reed have also won black shirts. --Ambrose (Amby) Burfoot became the first Boston Marathon winner (1968) ever to race in the Dipsea. Burfoot had entered in the centennial year of 2010 but bowed out with an injury. Though he had hopes for a black shirt, a course reconnaissance four days before the race—he lives in Connecticut--convinced Burfoot to aim simply for a safe finish. He ended up 541st in Invitational, with the 1,063rd fastest time overall (1:37:31, 21hc). --Dipsea Foundation scholarships were awarded to Joseph Biehl (Desert Christian HS), Sage Mace (Tamiscal), Annika Levaggi (Tamalpais), Elizabeth Labeewu-Anderson (Tamalpais) and Zoe Hebermann (Branson). --The Jack Kirk Dipsea Demon trophy was won by Christie Patterson Pastalka, still racing 30 years after she won the Dipsea. The Norman Bright Award was presented to Don Makela, who finished 81st just three years after cardiac artery replacement surgery. And the Red Tailed Hawk trophy went to retiring start line announcer Bob Cullinan. --At the awards ceremony, mention was made was made of a fundraising effort to save Jack Kirk’s beloved 400-acre Mariposa property from development. Kirk died without a will or immediate relatives. The contact is sierrafoothill.org. There was also an announcement of the planned 100th anniversary celebration of the first Dipsea Women’s Hike, to be held April 21, 2018. Bobby Van Meurs, daughter of the 1918 Hike winner Edith Hickman, attended the Dipsea Foundation dinner along with her own daughter. --For the first time, drones (acquired by the Dipsea Committee) were used in the Race. Drone footage dramatically enhanced Tim Amyx’s film of the event. --On June 17, Jake Schmitt won DSE Double Dipsea by nearly 12 minutes. He ran 1:48:24 (scratch), the only runner among 689 finishers to break two hours. Katie Fast was swiftest female with her 2:24:27 and finished third overall. --Shortly after the Double Dipsea, work began on replacing the middle/second flight of the Dipsea Steps in Mill Valley. The project was largely funded, as had replacement of the first and third flights, by the Dipsea Foundation through individual purchases of step plaques.